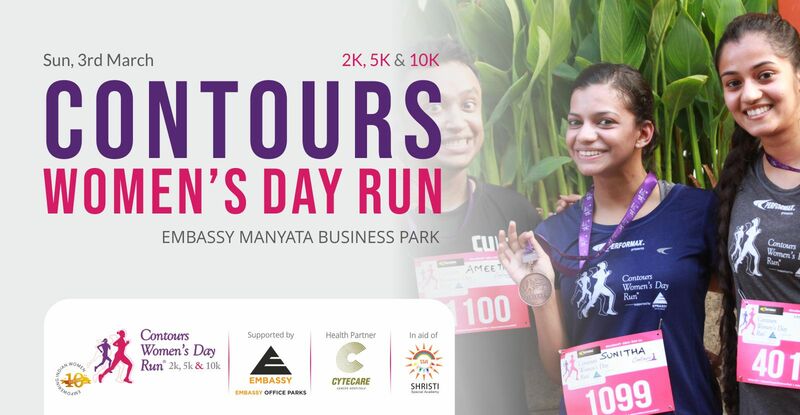 CWDR 2019 is on Sunday, 3rd Mar and is hosted by Embassy Manyata Business Park, Bengaluru. Yes the Run is for both Women and Men. The registration fee for 10K and 5K categories includes Timing chip, Race Day T- shirt, finisher Medal, Downloadable certificate and post run breakfast. For the 2K category, the adult gets a T- shirt, child gets the medal + downloadable certificate and both get breakfast. For Timed 10K Run, participant should be above 15 years as on 3 March, 2019. For Timed 5K Run, participant should be above 12 years as on 3 March, 2019. For 2K Fun Run, minimum age for a child is 6 years. Minors between 6 and 12 years should be accompanied by adults. T shirts will be given to the first 1500 registrants only. Do register early. Registrations will close on 24th February 2019. Please note that only the first 1500 registrants are entitled to T- Shirts. When and where can I pick up my bib? Locations are – Contours Fitness studios at Koramangala, HSR Layout, Jayanagar, Ulsoor and Bannerghatta Road. Refer www.contours.in for location details. For all these queries or any support that you may need on your registration, please contact support@youtoocanrun.com. You may also reach them on 022-26651520/26652523. Contours is a chain of international fitness studios dedicated to improving the health and fitness of women. We are India’s largest women’s fitness chain with 10 gyms and over 2200 women achieving their fitness goals. CWDR is how we like to celebrate the spirit of being a woman, of giving and redefining personal limits.